This collage is in response to the video, More Human than Human. It looks into the idea that society, for as long as it has existed, has idolized and created the perfect image. From the Venus of Willendorf, with robust features representing fertility, to the muscular and godly figures on the Riace Bronzes, we have always used sculpture as a way to portray how we think people should look. Today we can see this in magazines and advertisements, with models who have absurd amounts of makeup adorning their faces. 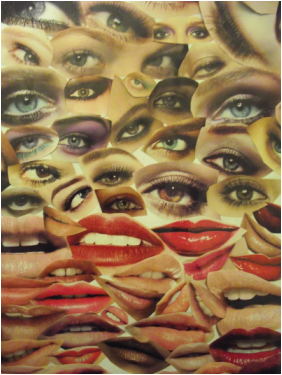 I chose to compose a collage mainly of eyes and lips because I feel that these are the most "dressed" areas of the face in most of the advertisements. When you first meet someone, their eyes are what you make contact with. And we watch as their lips move and they talk. These features command attention, therefore receive the most attention when in front of a mirror. Although each individual pair of eyes or lips may seem beautiful, when you piece all of them together, the result is almost nightmarish: eyes and lips scattered across the page. Its a little creepy to look at when you zoom out and look at the whole thing.